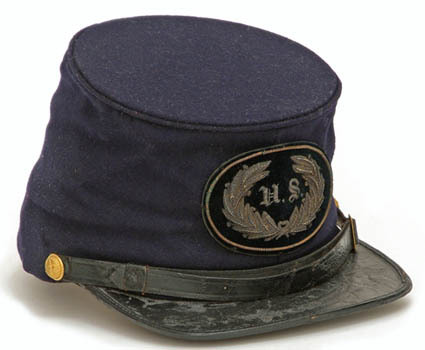 The forage cap was originally adopted by the U.S. Army in 1857 and modified in 1861. The Regulations of 1861 say only of pattern in the Quartermaster General's Office." Forage caps were worn by both officers and enlisted men and were of a similar general appearance. 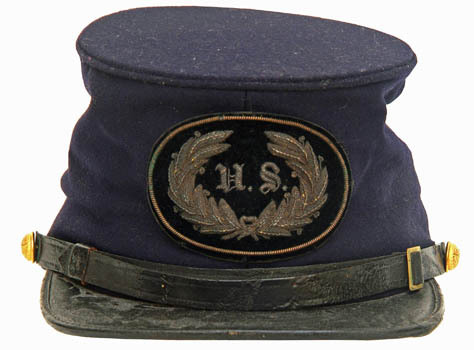 Officer's caps were privately purchased from hatters and lack the uniformity of issued items, which were made to pattern. The pictured forage cap is that of a staff officer or general officer. The front of the cap has a U.S. wreath embroidered on an oval and surrounded by Jaceron wire. This insignia was used originally on the 1839 pattern forage cap and continued in use until 1895. This particular forage cap has a large U.S. wreath, similar to that worn on the "Jeff Davis" hat. A smaller version of the U.S. wreath was also in use and in the case of the Chasseur style forage caps necessary because of the lower crown. The crown of the cap is high and the visor flat. There is a typical chin strap with brass keeper and small general staff buttons attaching this on either side. The original owner of this particular cap is unknown. This type of cap would have been worn by general officers; members of staff departments, such as engineers or paymasters; and members of regimental staffs; such as surgeons or quartermasters.